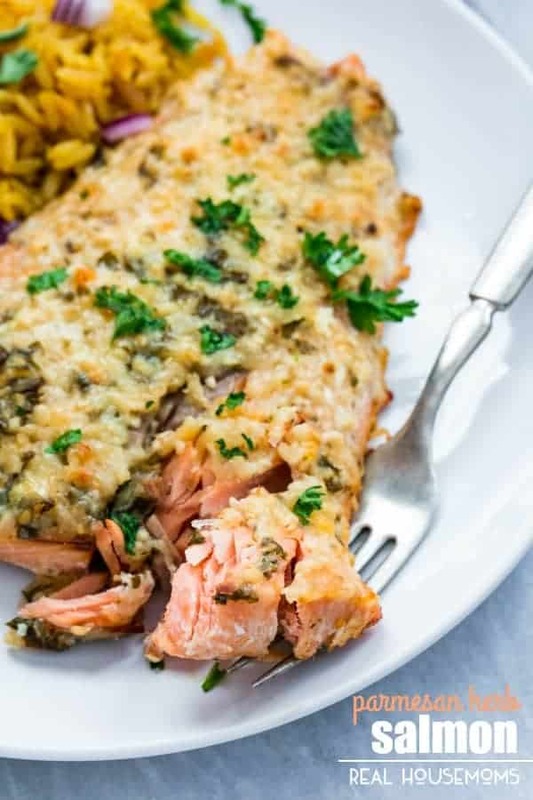 Easy 20-minute baked PARMESAN HERB SALMON with a savory parmesan cheese crust makes the perfect no-fuss weeknight meal! It seems like people either love seafood or totally hate it – never in the middle. I personally am a lover of all things seafood and salmon is hands down one of my very favorite types of fish. Maybe my most favorite. I just can’t resist that not-too-fishy flavor and flaky texture. Mmmmmm. I still remember the very first time I had salmon when a neighbor brought my family a couple of HUGE Alaskan salmons he brought back from a fishing trip. I’m pretty sure I ate my body weight in salmon that day. 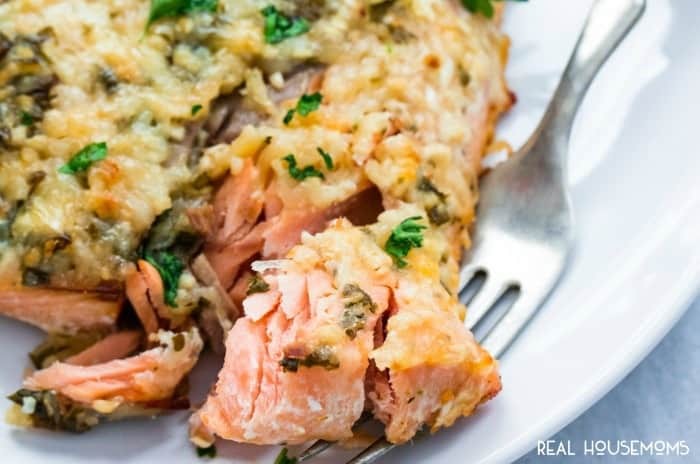 This easy parmesan herb salmon is buttery, flaky, and perfectly seasoned AND it comes together in just 20 minutes! We served ours with fresh parsley on top and rice pilaf on the side and it was a huge hit at my house. If you like salmon, parmesan, and quick no-fuss dinners, you will love this dish! 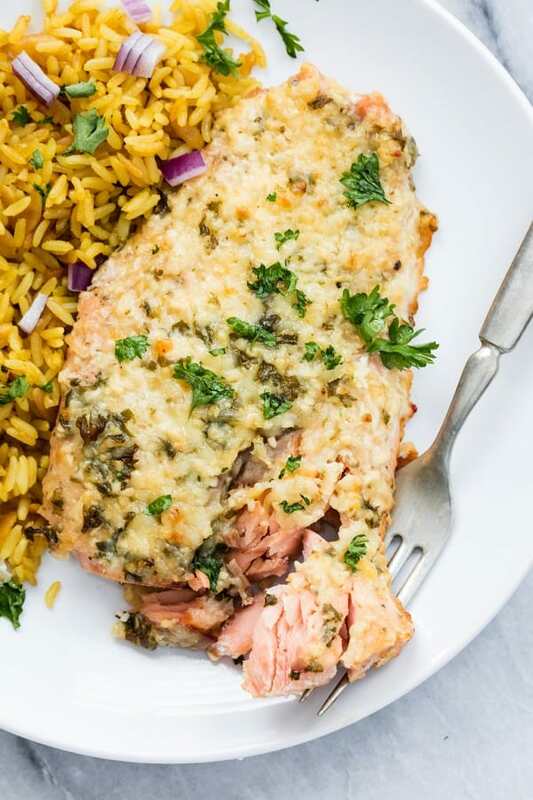 Easy 20-minute baked parmesan herb salmon with a savory parmesan cheese crust makes the perfect no-fuss weeknight meal. Preheat oven to 400 degrees. 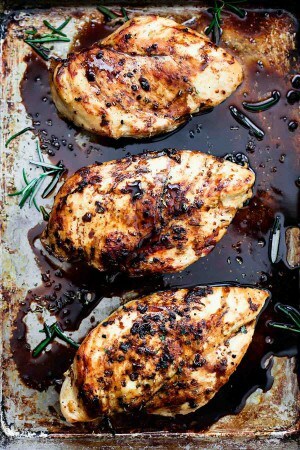 Line a baking sheet with foil and lightly grease the foil. Lay salmon in a single layer on foil and season with salt and pepper. 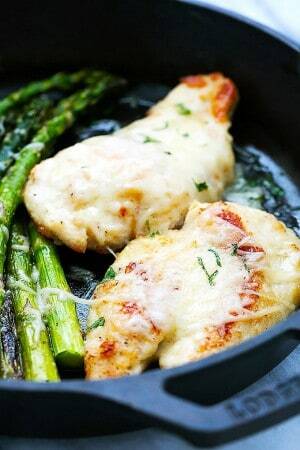 Brush with melted butter, then sprinkle with Italian seasoning and top with parmesan cheese. Bake for 10-15 minutes until salmon is flaky and cheese is completely melted. Serve hot garnished with freshly chopped parsley and served with rice pilaf if desired. I made this for New Year’s Eve, and it is not the last time I will make it. It tastes really good! It’s also a perfect summer evening meal!